To combine German “Gemuetlichkeit” and culture is our main concern. 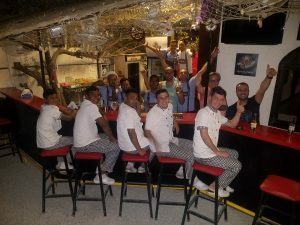 Our restaurant manager Delon David and his crew are always at your disposal to offer you a nice break away from home and make you feel like being on holidays in Germany. Famous is our „Stammtisch“ for German Speakers which welcomes newcomers from Germany, Austria or elsewhere to exchange important news and gossips about Kurdistan and to receive the latest information from back home. Small talk, fun, entertainment and a fresh cold draft beer – Made in Germany -, that’s our “Stammtisch”. 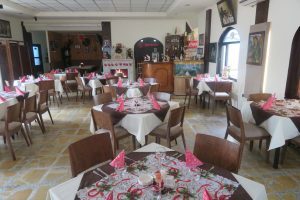 At our Restaurant, we provide German Atmosphere for up to 60 guests, while our Beer Garden may accommodate up to 200 guests to relax and to enjoy oneself. Our friendly staff are always at your disposal to offer you a nice break away from home. Our kitchen, which is working according to European hygiene standards, offers you a wide variety of good and tasty food. Come in and feel good!! !